Summary: Slight chance of storms today. Bigger chance of storms later this week. 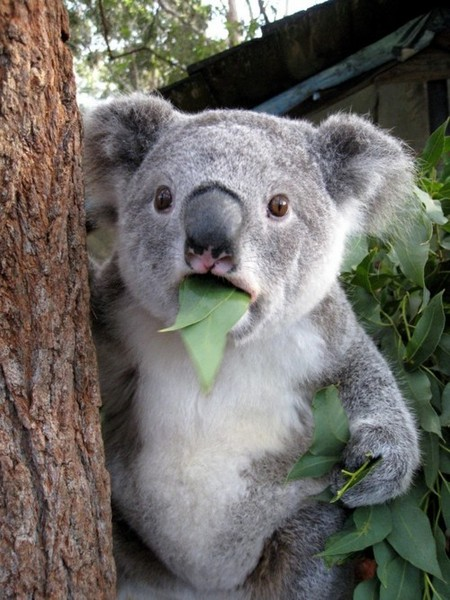 Today our temps will rise to about 72 degrees. There is about a 20% chance of rain and possible thunderstorms in the afternoon hours as a warm front moves up over MidTN from the south, but these storms are not expected to be severe. NWSNashville believes Middle Tennessee could see strong storms west of I-65 and south of I-40 – AKA our piece of the MidTN pie (am I the only one that sees MidTN split up into equal pie slices thanks to our interstate system?). With a 20% chance of rain in the afternoon, it is likely some or all of the county won’t see rain. 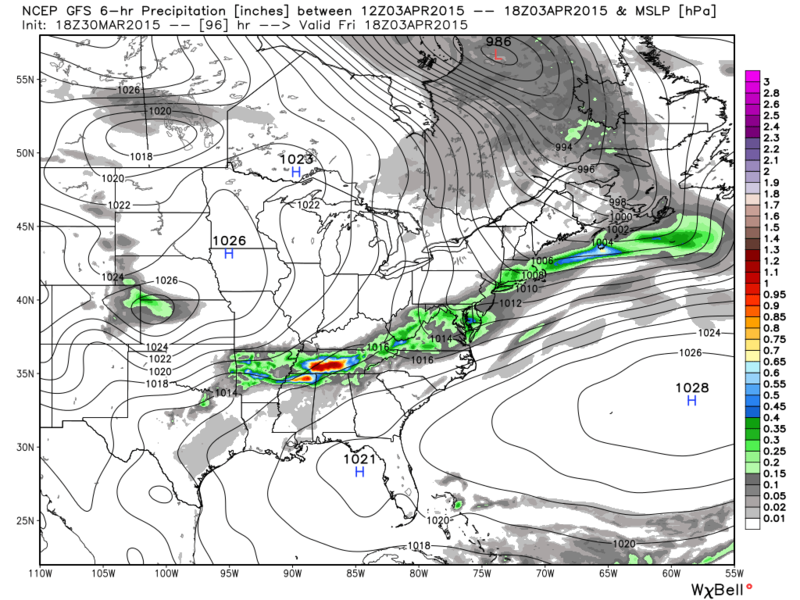 NAM12 model is showing rain developing close to the Mississippi/Tennessee/Alabama borders at about 6pm CDT. 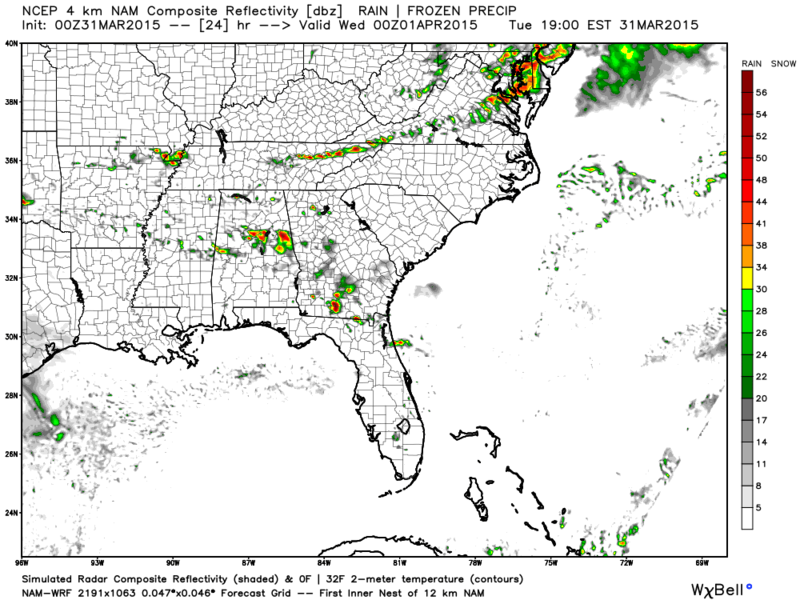 Hi-Res NAM doesn’t even show that at 6pm CDT. Overnight lows for Tuesday night will around the 48 degree mark. Wednesday looks to be pleasant. Thursday and Friday will be wet and stormy. Wednesday’s high will be 75 degrees as the daytime hours look to be pleasant and dry. Wednesday night is where we are likely to see a small chance of rain as a cold front works its way toward us. Chance of rain Wednesday night is about 30%. Overnight into Thursday the low temperature will fall to a mild 57 degrees. 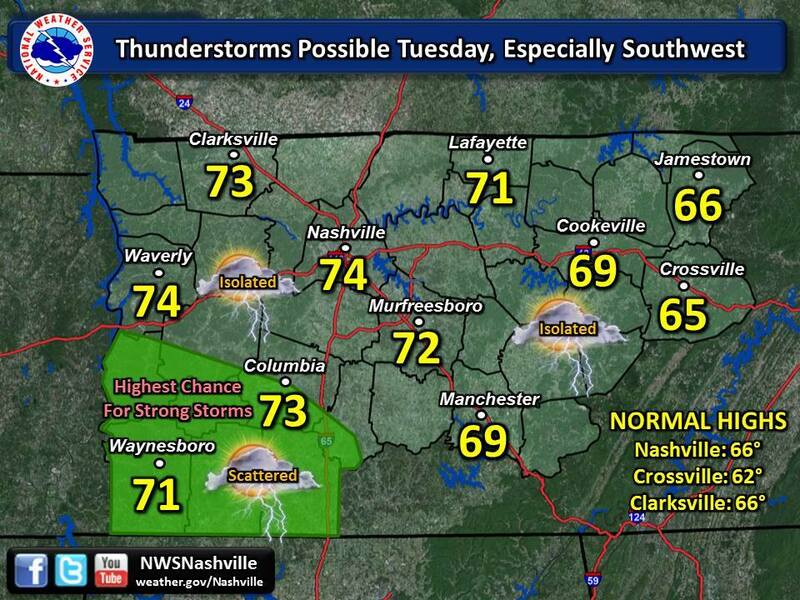 Thursday will greet us with a 40% chance of rain and storms, and a high temperature of 79 degrees. Lots of moisture will be in the air for the incoming cold front to work with, setting off some possible storms. Storms on Thursday are not expected to be severe. Thursday night’s low temp will be a mild 60 degrees. 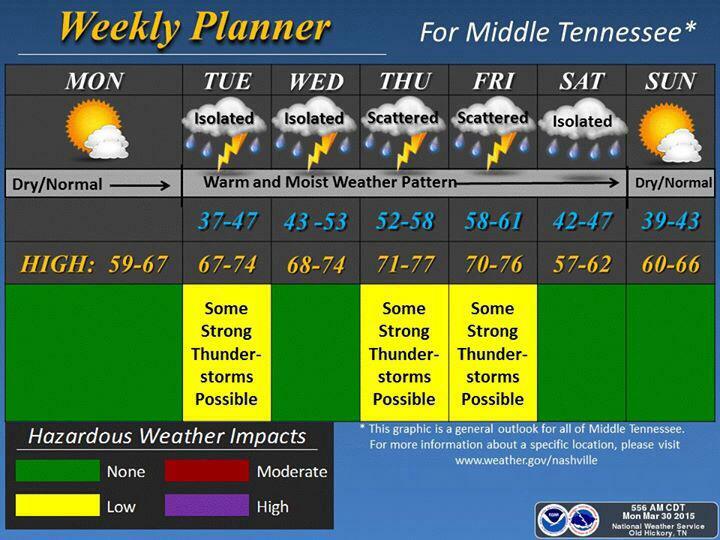 Friday has the greater chance of possible strong to severe storms as the cold front finally reaches Middle Tennessee. Friday’s high will be 74 degrees before the cold front knocks down temperatures into seasonal high territory for the weekend. Storm Prediction Center has the current Day 5 (Friday) forecast as a 15% chance of severe weather southwest of us (Memphis and beyond). This is what we will be keeping our eyes on for the chance of severe weather on Friday. Forecasts change multiple times a day, but our best thinking is that the best chance for severe weather over the next 7 days is likely to be Friday. 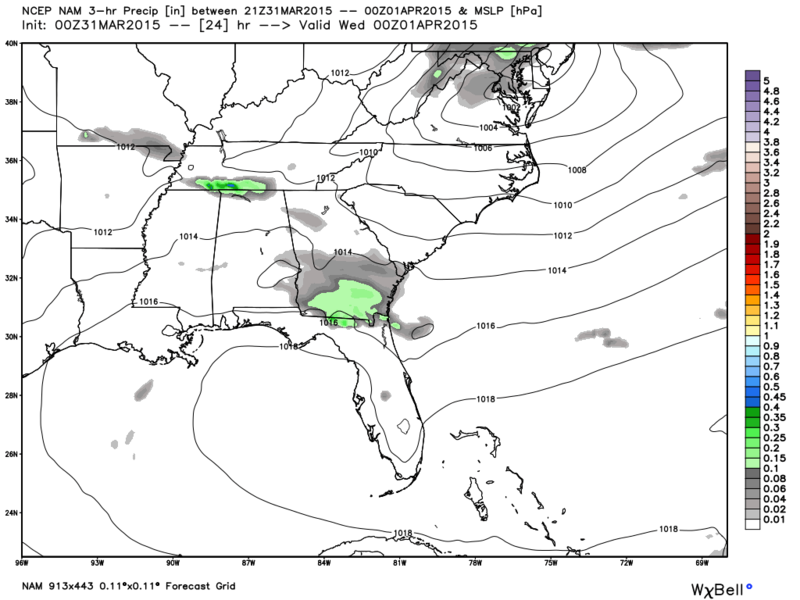 Below is one model’s take on the incoming cold front (at noon Friday April 3rd). The long range models right now don’t agree on timing. So our best guess is between noon and 6pm. Since it is still four days away, anything could change and we will likely know more if this is a severe weather event closer to Friday. Easter still looks dry and pleasant. Nothing has really changed with the Easter forecast: Saturday high of 62 and Sunday high of 68 with no chance of rain in the forecast.